Continuing with the "hero numbers", today we have #300....Rusty Staub?!? 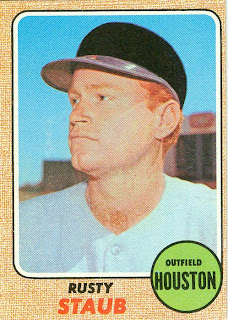 If I was compiling a list of "hero status" players from the late 1960s (and here's 58 names to get you started), I'm not sure Rusty Staub would be in my top 50, let alone the top 5. 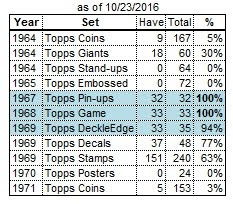 Yes, he was a good player, and one of the best 2 or 3 on the Astros at that time, but in the top 5 (for #100, 200, 300, 400 ,500)? 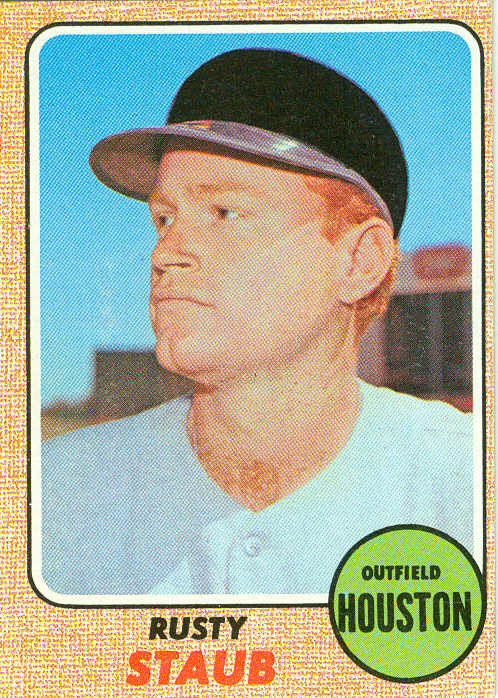 Here we see Rusty in Topps' patented 1968-69 Astros' regalia. (They forgot to airbrush-out the reflection of the Astros' logo on the helmet bill!) Staub is entering his final year in Houston, as he would become the Montreal Expos' "Le Grand Orange" in 1969. Staub was signed by the Houston Colt .45s in 1961 (before they even fielded a major-league team). He spent the 1962 season as a 1st baseman in class-B. 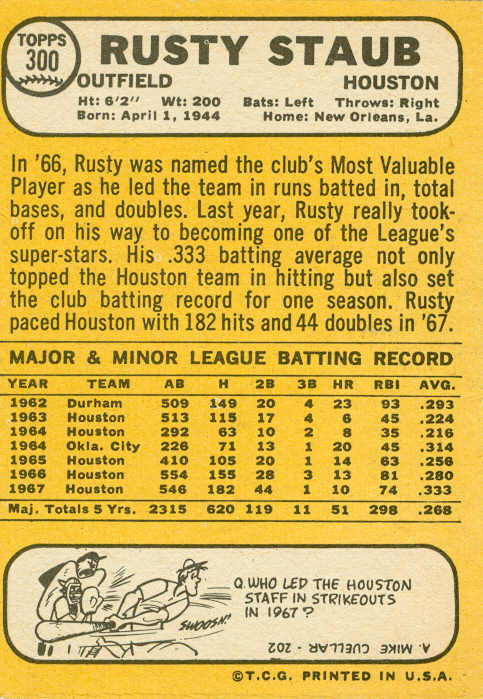 Rusty made his big-league debut in April 1963 at age 19, starting 2/3 of his games at 1B and 1/3 in right field. He was the starting 1st baseman for the first half of 1964, but lost the job to Walt Bond in early July. 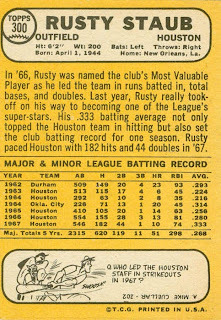 Rusty was the team's regular right fielder from 1965-67, then moved in to 1st base for the 1968 season. In January 1969, he was traded to the expansion Expos for outfielder Jesus Alou and 1st baseman Donn Clendenon. When Clendenon refused to report (having had enough of manager Harry Walker while both were with the Pirates), the Expos sent pitchers Jack Billingham and Skip Guinn. Staub was an immediate hit in Montreal (see comment #5 here). Dubbed "Le Grand Orange", he was one of the Expos' bright spots in their early years. In his 3 seasons with the Expos, he averaged 160 games played as the team's right fielder, and made the all-star team each year. 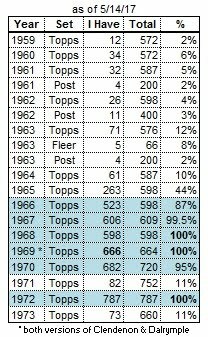 Staub played right field for the Mets from 1972-75, then 3 1/2 seasons with the Tigers (as the right fielder in 1976, then the DH for the other years). In July '79, he returned to Montreal for the remainder of the season. After one season (1980) with the Rangers, Staub spent the rest of his career (1981-85) with the Mets, mostly as a pinch-hitter.